Looking for a cluster computing system that provides high-level APIs? 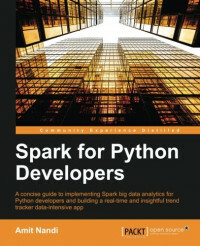 Apache Spark is your answerâan open source, fast, and general purpose cluster computing system. Spark's multi-stage memory primitives provide performance up to 100 times faster than Hadoop, and it is also well-suited for machine learning algorithms. Amit Nandi studied physics at the Free University of Brussels in Belgium, where he did his research on computer generated holograms. Computer generated holograms are the key components of an optical computer, which is powered by photons running at the speed of light. He then worked with the university Cray supercomputer, sending batch jobs of programs written in Fortran. This gave him a taste for computing, which kept growing. He has worked extensively on large business reengineering initiatives, using SAP as the main enabler. He focused for the last 15 years on start-ups in the data space, pioneering new areas of the information technology landscape. He is currently focusing on large-scale data-intensive applications as an enterprise architect, data engineer, and software developer. He understands and speaks seven human languages. Although Python is his computer language of choice, he aims to be able to write fluently in seven computer languages too.